Paramount Home Entertainment has announced that Watchmen will be available to purchase on DVD and Blu-ray in the UK on 27th July 2009. Directed by Zack Snyder (300), Watchmen is a based on the 1986-1987 comic book limited series Watchmen by Alan Moore and Dave Gibbons. Listed in Time magazines "All-Time 100 Novels", the film adaptation stars Malin Akerman, Billy Crudup, Matthew Goode, Carla Gugino, Jackie Earle Haley, Jeffrey Dean Morgan and Patrick Wilson. At the beginning of April we reported that four pages of original Watchmen artwork by artist Dave Gibbons that had just sold on eBay, selling for between £4,058 and £5,600. Since then, three more pages have been sold. The first went for only £1825.81, but then it was page 28 of Chapter 9. 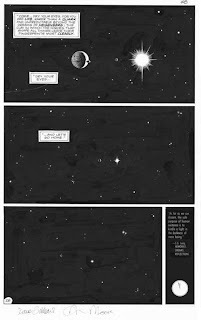 (To save you digging out the graphic novel that particular page is simply three panels of space with the Sun, Earth and Mars reducing in size as the view pulls out, not the most riveting subject matter. Still, it was signed by both Dave Gibbons and Alan Moore and came with John Higgins' colourist page). Next came the page before it. Chapter 9 page 27 shows the smiley face in a crater on Mars - a much more striking image. Again signed by Gibbons and Moore, with its colourist page it went for £2422.13. 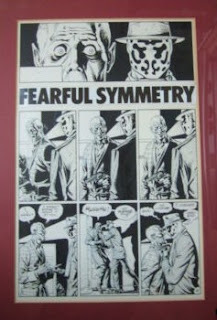 The best is left for last however - the original art from Chapter 5 page 4 which is the chapter title page, Fearful Symmetry, showing Rorschach's encounter with Molock. Remember that the most expensive page from the recent batch of sales up to this point was £5600. This one however, just blew the rest of them out of the water. The final price? After over 1300 page views and 36 bids from thirteen different bidders, three new people bid on it within the last six seconds of the sale, their bids pushing the price up by £1100. The single page of art sold for... £12,601. Concluding comic book publishing month on radio show and podcast Strip!, Alex Fitch interviews Kenny Penman who runs Blank Slate Books, a new British publishing company that has been around for just under a year and have four books to their name so far, including Eisner award nominee Trains are... Mint by Oliver East and and Mawli's We can Still be Friends. Alex and Kenny talk about what factors decide the choice of books he publishes, the travails of finding a market for new graphic novels in the middle of a credit crunch and how his history as one of the founders of Forbidden Planet International has helped his new career as a publisher. Trains are... Mint received high praise from several quarters on release. 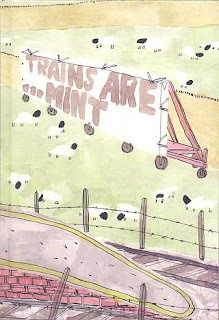 It's a diary of walks tracing the train tracks between Manchester and Blackpool in the northwest of England, the comic dispensing with word balloons in favour of text and speech written in longhand superimposed upon the images. "Oliver East has produced one of the most unique works to come out of the UK small press scene," says Kenny Penman, "and one that I believe has a chance of crossing over to a much wider audience." Producers Ralph Titterton and Tim Mallett have assembled 40 tracks representing the best of TV and film music genius Barry Gray, capturing some of the very best of his theme work that graced many classic 1960s shows produced in the UK. 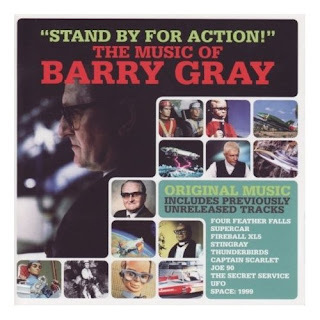 Beginning with their earliest television programmes, Gerry and Sylvia Anderson's series featured the distinct musical compositions of Barry Gray, an unassuming but innovative genius who was responsible for the themes and incidental music for shows like Thunderbirds, Space: 1999, UFO, Stingray, Joe 90, Captain Scarlet and the Mysterons and more. Some of the best of Gray's unforgettable music has been collected in one album by Silva Screen Records, available from 4 May physical and MP3 format. Many of the tracks have never been offered commercially before, with highlights including music from The Secret Service and UFO, different title themes and library tracks used for Supercar and Fireball XL5. This release celebrates the career of one of television's greatest composers and features an extensive collection of music from 10 of his Gerry Anderson collaborations. Also included is unreleased material, newly discovered mixes and an extensive booklet packed with memorabilia and track by track notation from Barry Gray archivist Titterton. • In his latest Lyin in the Gutters column, Rich Johnston reports Mark Millar and Bryan Hitch's Fantastic Four run for Marvel has had an altered schedule due to personal issues for both creators. The last double-sized edition, #569, has been co-written by Jo Ahearne and pencilled by Stuart Immonen, while Bryan Hitch works on his new project with Ed Brubaker, Reborn. 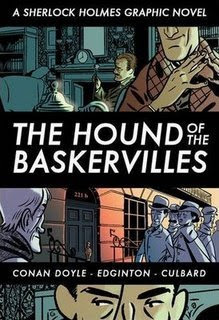 • Talking of Gosh, 'tis they that report that the creative team behind Eye Classic’s The Picture of Dorian Gray adaptation are back with The Hound of the Baskervilles, the first book in a series adapting the complete Sherlock Holmes stories into graphic novel form. It's written by Ian Edginton, who among other projects, has an issue of IDW's Star Trek: Alien Spotlight out soon, unsurprisingly focusing on those pesky Romulans, the villains of the new movie out 8th May. 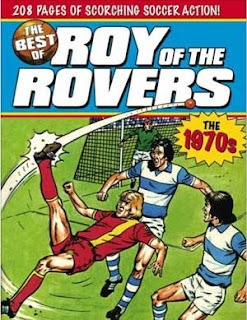 • Titan Books next Roy of the Rovers collection will be published on 21 June. The Best of Roy of the Rovers: The 1970s celebrates another momentous decade in the career of soccer's greatest player, Roy Race, as he competes to win the £30,000 Goal Rush Challenge, teaches how to play American Football, tackles the problem of hooliganism head on and struggles to control Melchester's latest signing - the fiery, arrogant but highly talented Paco Diaz. Titan says this volume also features a selection of features and articles taken from the original Roy of the Rover comic, including a 2 page feature written by Eric Morecambe. Also included is a selection of period ads for legendary toys including Chopper, Dinky, Corgi and a variety of Kellogg's long defunct breakfast cereals. This British comics release is quickly followed, at last by Best of Battle Volume 1, out on 26 June. Over 300 pages of relentless action are collected from the top-selling war comic of the 1970s and 80s, from the desperate dogfights of Johnny Red to the down-and-dirty Rat Pack, the reflective, critically acclaimed Charley's War and the uncompromising Hellman of Hammer Force. Featuring work by Pat Mills and John Wagner , Joe Colquhoun and more. 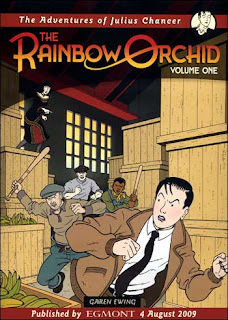 Garen Ewing's full web version of his comic strip The Rainbow Orchid, is going to remain online for just one more week. story available in print only." You can start reading The Rainbow Orchid here: don't hang about, because you've got only a few days left to do so! to name just a handful." a real delight. Garen Ewing's mix of engaging characters, exciting old-school adventure, attractive ligne claire artwork and fluid storytelling makes The Rainbow Orchid easily one of the best graphic novels of the year." After the successful second Hi-Ex comics convention held in Inverness on Valentine's weekend this year, organisers Vicky Stonebridge and Rich Clements have been in touch to let us know that Hi-Ex will return in 2010. After heavy snowfall prevented many making their way to the inaugural Hi-Ex in 2008 and a close call with the weather again this year, Vicky and Rich have decided to slip the convention to slightly later in the year. Hi-Ex 3 will take place on the weekend of 27/28 March 2010. This means that Hi-Ex will remain the first British comics convention on the calendar (unless of course a new, young upstart appears on the scene). Since that weekend is also the start of British Summer Time in the UK in 2010, it means that the clocks will go forward on the Sunday morning - which should prove interesting for those recovering from the previous night's hangover! As with the previous two Hi-Exs, Hi-Ex 3 will take place in Eden Court on the banks of the River Ness, only a short walk from Inverness' town centre and railway station. Guests will be announced closer to the time.